Discover a world in one country where rich and varied colours, cultures and traditions come together in this vibrant Rainbow Nation. 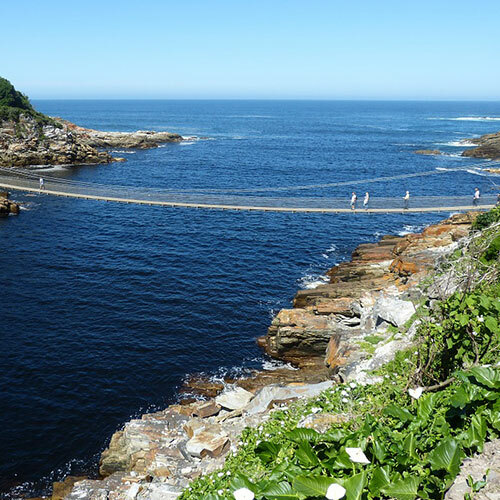 A rich variety of experiences, adventures and attractions await visitors to this diverse county at the southern tip of Africa. 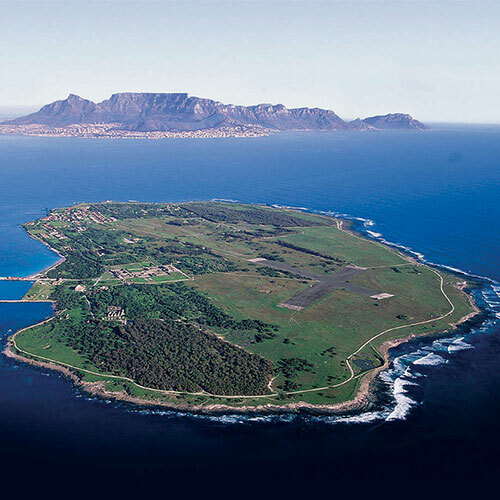 Stroll through the rich Winelands, explore rolling plains alive with varied wildlife, soak up the different cultural experiences or travel to the southernmost tip of Africa, where two oceans meet and the unmistakable shape of Table Mountain casts its level gaze over the city of Cape Town. 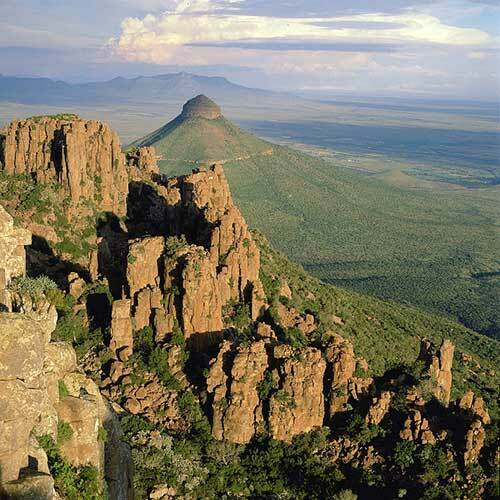 South Africa is known for its rich spectacular scenery and natural landscapes, from the soaring mountain peaks of the Drakensberg mountain range to the endless vistas of the Karoo. Walk through dense and ancient forests or stroll unspoiled coastlines, the surroundings will sooth or thrill you and make for a remarkable backdrop to your travels. 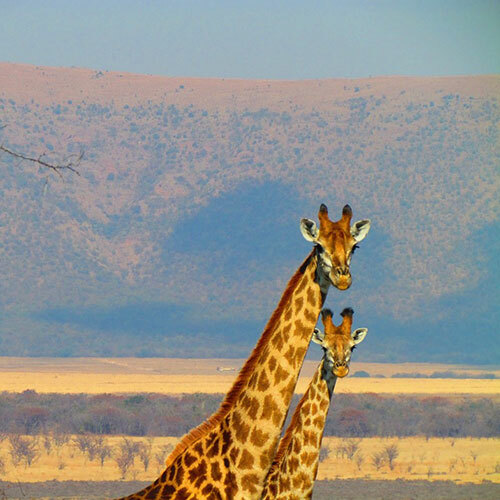 A well-established safari destination, South Africa offers game lodges and National Parks that cater for all budgets, from luxurious private game lodges with impeccable service and cuisine to affordable rustic self-catering huts and cottages at the rest camps of various National Parks. 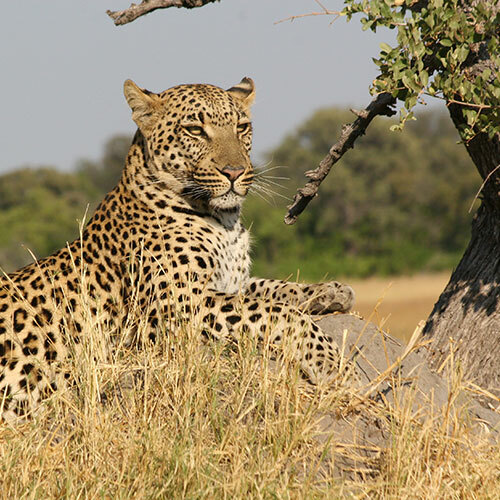 Whether on foot in the company of an experienced guide, in your own rental vehicle or on an open safari vehicle, the wildlife encounters that South Africa has to offer will add up to safari adventures that will exceed your wildest expectations. Spectacular wildlife encounters are not limited to the land – South Africa offers magnificent marine life experiences as well. The adventurous souls can sail beside a whale, go eye to eye with wild Tiger sharks and cage dive with Great White sharks whilst those less adventurous can be charmed by urban penguins or enjoy the magic of watching newborn turtle hatchlings make their bid for life in the ocean. For those who wish to soak up the history and culture of the country, there is are many different experiences to choose from. Learn more about the struggle for independence and the more recent struggle for democracy in Tshwane (Pretoria) and Johannesburg. Listen to the tales of bygone battles on the Battlefields of Kwa-Zulu Natal or enjoy a vibrant and entertaining dinner at a cultural village. South Africa has a very varied climate from one region to the other. In general, the best months to travel are the winter months when game viewing is an important part of your holiday – especially for the inland parks. The Cape area experience winter rainfall and for parks in that area, the opposite would be true with regards to game viewing. 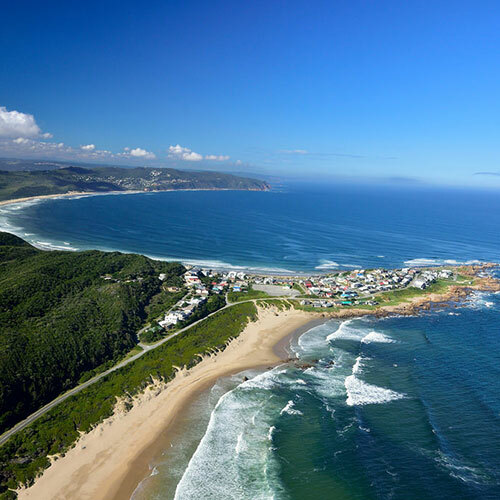 The best time for a Cape beach holiday would be from November to March. 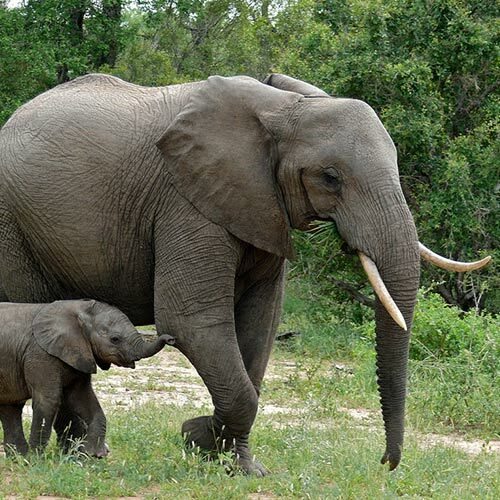 More or less all of the rest of the country, including popular destinations like the Kruger National Park, have heavy summer thundershowers from December to March. The winter months, from May to October, tend to be dry. Note that the months of June to August tend to have very cold mornings and evenings and it is better to change to accommodated options when in mountainous areas like the Drakensberg. English is widely spoken, major languages include isiZulu, IsiXhosa, Sepedi, Setswana, Sesotho, Afrikaans and Xitsonga. Biltong and “droëwors” is salted dried meat with traditional spices – a favourite among South Africans while watching rugby games. Bobotie is a dish of Malay decent served with yellow rice, sambals, coconut, banana slices and chutney. Boerewors is a great sausage to compliment a braai (BBQ) and the famous boerewors rolls with a salsa is a great handheld snack. Koeksisters are a deep-fried twisted pastry soaked in syrup and a favourite dessert in this country. South Africa’s three major international airports are OR Tambo International Airport (Johannesburg); Cape Town International Airport (Cape Town); and King Shaka International Airport (Durban). There are also many regional airports, including the Kruger Mpumalanga International Airport in Mbombela (Nelspruit). Most car rental companies are represented at South Africa’s main airports and in most city centres. Vehicles may generally be picked up at one centre and dropped off at a branch in another centre, subject to a fee. It is advisable to take out the insurance offered by the vehicle rental companies, unless you have specific cover in place. All major credit cards are accepted. South Africa’s currency is the Rand (ZAR) and comes in a range of coins (R1 = 100 cents) and note denominations of R10, R20, R50, R100 and R200. South Africa is known for its multitude of warm sunny days, hence the title, ‘Sunny South Africa’. Most of the nine provinces have summer rainfall, except for the Western Cape, which experiences winter rainfall. The high-lying areas, such as the Drakensberg mountains in the interior of Kwa-Zulu Natal, can be chilly in winter. South Africa has a well-developed communications infrastructure. A number of cellphone providers offer national coverage and there are well-established landline phone networks. Internet and Wi-Fi are easily accessible in most urban areas although access to free Wi-Fi is still limited. Most hotels and lodges offer a guest computer of access to Wi-FI which may be a chargeable service. There are nine provinces in South Africa, namely: Eastern Cape, Free State, Gauteng, Kwa-Zulu Natal, Limpopo, Mpumalanga, Northern Cape, North West and Western Cape. South Africa is a true Rainbow Nation with 11 official languages, namely: English, Afrikaans, isiNdebele, isiXhosa, isiZulu, Sepedi, Sesotho, Setswana, Siswati, Tshivenda and Xitsonga. Although less than a quarter of the population has English as their mother tongue, English is the language most widely understood and generally the second language of the majority of South Africans. About 80% of South Africa’s population is Christian. Other major religious groups include Hindus, Muslims, Jews and Buddhists. The country’s Constitution guarantees freedom of worship. Use common sense and take basic safety precautions. Keep valuables locked away and don’t wear expensive watches or jewellery, flash expensive cameras, or walk in deserted areas. Keep car doors and windows locked at all times. If in doubt, ask a guide or at your accommodation for safety guidelines. As a rough guide the customary tip for a waiter in a restaurant is between 10% to 15% and about USD10 (or equivalent) per day to a game ranger. However, the tip amount is a personal decision and should be based on whether the service exceeded your expectations. South Africa has an extensive road infrastructure including national highways and secondary roads. Speed limits are set at 120km/h on highways; 100km/h on secondary roads; and 60km/h in urban areas. Most roads are in good condition, but there are exceptions especially in more rural parts of the country. Keep left, pass right is the general law of the road. South Africans drive on the left-hand side of the road, and the cars – rental cars included – are therefore right-hand drive vehicles, the gear shift being operated with the left hand. All distances, speed limits (and speedometers) are marked in kilometres. Wearing of seat belts is compulsory. Using hand-held phones while driving is against the law. There are rail connections between the main centres, such as Johannesburg and Cape Town. In urban areas tap water is usually of high quality and safe to drink. It’s quite normal to have ice in drinks in South Africa. However, when travelling to remote rural areas and the bush you should buy bottled water. Uitkyk Holidays is your appointed ground handler for this journey. In case of any emergency or problem that may arise during your travels, please contact Uitkyk Holidays immediately for assistance and so that they matter may be resolved. Uitkyk Holidays will not be held responsible for any refunds or claims that are only brought to their attention after the completion of your trip. Exchange money at the Airport as you will get the best exchange rate there. It is recommended to always have some local currency on you to use to pay for toll fees and entrance fees as credit card facilities are not always available. Please note that for Botswana you will require Botswana Pulas to pay for extras. For Namibia it is Namibian Dollars but South African Rands is also accepted in both Botswana and Namibia. For Zambia & Zimbabwe it is best to have American Dollars with you. For Mozambique you require some Meticais, but South African Rands and US Dollars are also generally accepted (exchange rates not favorable when paying in a foreign currency). Euros will also be accepted but you will not receive a favorable exchange rate. It is highly recommended that you double check the distances, to be driven the following day, the night before and ensure you leave early enough to allow sufficient time to reach your next destination before dark. It is not recommended to drive at night especially in areas and cities that you are unfamiliar with. Kindly remember that the approximate distances shown on your day by day directions is merely that – an approximate calculation of the distance you will be traveling. We work on local maps and route descriptions provided by establishments, however, as there are generally more than one way to reach your next stop we can not give you an exact distance calculation. Please take into consideration that border crossings in Southern Africa can be a very tedious and time consuming process. It can take anything up to two hours to cross a border so please allow for this in your daily planning and kindly take into consideration the border operating hours. We have included directions in your Travel Papers that describe the process as much as possible, however, as these procedures and subsequent costs are controlled by the various Governments they have a tendency to change regularly without any notice. Please take into consideration that the traveling time on normal tarred roads in South Africa is approximately 1 hour per 100km. Gravel roads (and especially roads in Botswana, Namibia, Zambia, Zimbabwe and Mozambique) should be allowed additional traveling time for as these roads are not always in perfect condition and may have livestock or wildlife roaming freely near the roads. The speed limit inside the Kruger National Park, and other National Parks in South Africa, is generally 50 km per hour on tarred roads and 40 km per hour on gravel roads. A mere 100km can therefore take up to 4,5 hours to drive. Please take this into consideration when planning your next day. Please adhere to the speed limits at all times and remember to keep your seat belt buckled. There are traffic police throughout Southern Africa. If you are stopped by a traffic official please ensure that you show your car papers, license and third party insurance papers on request. If you can avoid it, do not hand your documents to the traffic official but rather present them clearly for inspection. If you have handed your documents over please ensure you receive all the documents back before you leave. Being friendly and polite will get you much farther then being rude to an official. Your tour package does not include any entrance fees, toll gate fees, conservation fees, border crossing fees ext. These are for your own account. 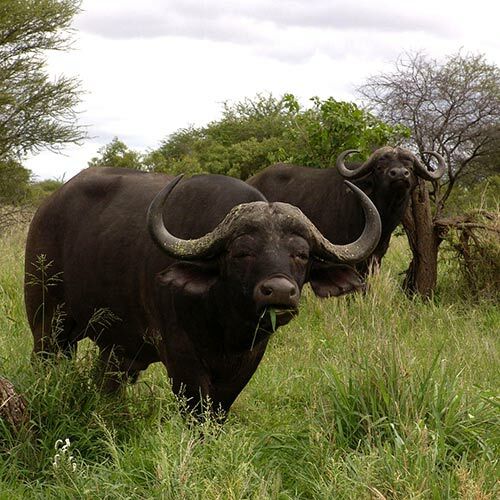 Entrance fees are payable at all National Parks and Game Reserves in Southern Africa. Please ensure you have sufficient cash on hand with you to do so. In South Africa, and surrounding countries, we drive on the left hand side of the road. Check on your travel documents for the gate opening and closure times for National Parks and ensure you plan your time so that you will reach your destination before the gates closes. You will be fined if you are found traveling inside National Parks, like the Kruger Park, after the camp or gate closure times. 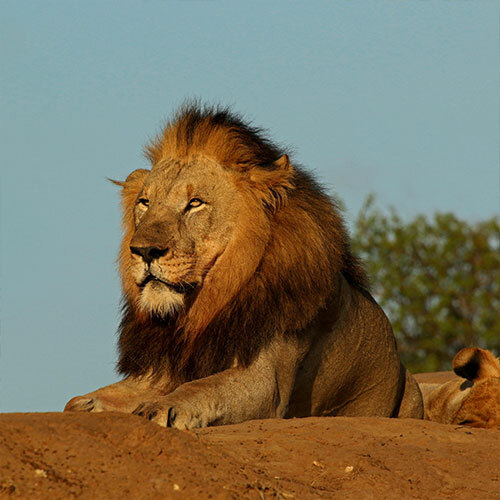 If you are visiting a private game lodge which is located for instance inside the Sabi Sands Private Game Reserve, try to reach the lodge before lunch time so that you are still able to enjoy lunch and be in time for the afternoon game drive around 15:00 or 16:00 (season dependant). Please refer to your local establishment (be it guesthouse, lodge, hotel or rest camp) for referrals to local restaurants, activities and things to do in the area. When traveling in Botswana, always talk to other travelers along the way about the roads they have already traveled to stay updated about road conditions and other information that might be handy. When you travel in Botswana and you are visiting more than one National Park, i.e Chobe, Moremi and Makgadikgadi Pans, ensure that you receive your white printed vouchers / receipts (used to be pink and green) back after showing it at the first camp, as you will need to show it again at all other camps. Failure to produce the papers will result in access being denied to you. Please note that the entrance fees for the Central Kalahari Game Reserve need to be paid in advance at either Gabarone, Ghanzi, Maun or Kasane. Failing to do so will mean you have to turn back and will not be allowed to enter the park. The entrance fees for Chobe, Moremi and the Makgadikgadi are paid at the Wildlife Office in either Maun, Kasane or Francistown. When driving to Mozambique or Botswana, fill up the fuel tank in South Africa before entering the neighboring country. It is always recommended to top up your tank regularly as fuel may not always be readily available in neighboring countries or rural areas. On receipt of your 4×4 rental vehicle it is very important that you personally check the inventory list thoroughly and ensure that everything has been included in the vehicle as specified (i.e. camping fridge, gas light, spare wheels ext). The camping gear is essential to your tour and it is therefore vital to check that everything has been packed accordingly. Once you are in the African bush there are no shops or assistance in the nearby vicinity. Should you require any additional gear you may request this at the depot. There are various insurance options and it is important that you familiarize yourself with all the options and the conditions as well as the costs. Your 4×4 has a standard insurance cover with an excess of ZAR 45 000. This can be reduced to either ZAR 20 000, at a cost of ZAR 150 per day, or to ZAR 0, at a cost of ZAR 300 per day (rates are subject to change without prior notice).This can be arranged before the start of your journey at the reception of the 4×4 Depot! Please ensure that you have your “Cross Border Letter” with you if you are planning to travel across the South African borders. Your name has to be clearly indicated on this letter. This letter will give you the required authority to take the rental car across the border of South Africa to Zimbabwe, Zambia, Mozambique, Botswana or Swaziland. Please take good care of your rental vehicle. It will serve not only as your vehicle but also as your bedroom, bathroom and kitchen for the duration of your journey. Dirt / Gravel roads are dangerous! Both wet and dry weather conditions can make these roads problematic. The 4×4’s are specifically designed to be strong and durable to handle these roads and conditions but speed is the cause of many disasters. If you are unsure of a situation then please take the necessary precautions – such as checking the depth of small rivers and water pools before crossing them. Alternatively wait for another 4×4 to be in the area before crossing so that there is someone that can provide assistance and a tow if needed. Driving a 4×4 has a golden rule – “As slowly as possible and only as fast as necessary”. Ensure that you regularly top up your fuel tank(s). Firstly the distances between petrol stations are long and secondly it is not always guaranteed that you will find fuel at the next petrol station. This is and remains Africa! Ensure that you always have sufficient essential supplies with you – such as drinking water and food. There are not always shops available in the bush from which to purchase provisions. Wild Animals! 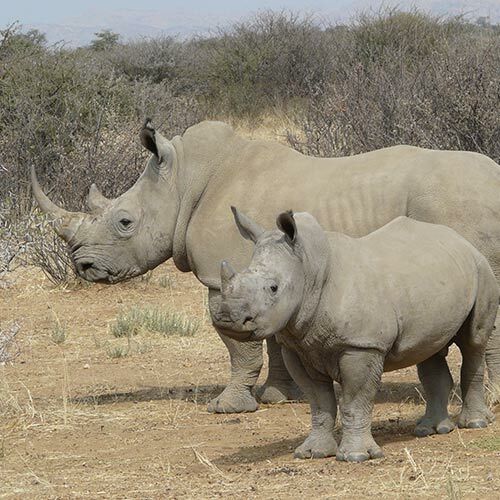 They will be a big part of your holiday in South Africa. The larger animals are not the only dangerous animals, best viewed and approached very carefully from within your vehicle, but the smaller animals can be just as dangerous and should be respected. You will more than likely be traveling with food items in your vehicle. Animals are able to smell this from a distance, especially Baboons and Hyena’s. Please ensure that your vehicle is always properly locked (windows closed completely) when leaving the vehicle and that all cutlery and crockery is cleared up and packed away. Firstly it is not good for the animals to scavenge from humans, as they become dependant on this and dangerous to all travelers, and secondly there are very few if any shops in the bush and you won’t be able to purchase new provisions! Our advice is that as soon as you start driving on a dirt / gravel road, please engage the 4×4 drive. This enhances the vehicles capabilities. The electronic Diff Lock should only be used at very low speeds! Also remember that it is not advisable to drive off the standard road – being tarred or a sand / gravel road. Should any damage occur as a result of the vehicle being driven off the marked or indicated route, the repair costs will be for your account as the insurance does not cover this! The motor home is larger, taller and heavier than the average vehicle. Usually in renting, you do not need to have a special license, but you certainly need to be much more careful while driving. Height limitations – remember your height limitations. The motor-home is always higher than you think it is, because of the cab over area and air condition box. Be careful and note the road signs while entering tunnels, under bridges, underground parking areas and other low height spaces. Weight limitations – overweight causes all kinds of problems such as getting out of control or even a breakdown. For this reason it is important that you keep to the maximum weight permitted. Backing up / parking – backing up with a motor-home is one of the most common reasons for collisions and accidents. Please perform this carefully. Due to the length of the motor-home, it is rather difficult to see the whole coach. Rear and side mirrors are not always very helpful to indicate the situation behind you. Therefore: [a]NEVER back up without someone to assist you. Ask one of the other passengers to get out of the vehicle and guide you from the outside [b] leave enough room in front of the motor-home in case you need to drive forward [c] backing up while parking in a campground also requires guidance and direction, because the driver cannot always see what is behind the motor-home. Mirrors – use your mirrors regularly to see what is going on behind you and next to you. The mirror on the driver side is always more reliable than the other side mirrors. Stopping – since the motor-home is a heavy and large vehicle, it takes it more time to slow down and accelerate. Avoid sudden stopping by changing gears gradually. Slow down when entering busy traffic, and make sure you have enough time to stop. Driving at night – this is not recommended for inexperienced motor-home drivers. Bumping into stray animals at night is very dangerous, especially in wildlife areas, but also regular roads. Parking on the side of the road is very dangerous, especially at night. If for any reason you need to do it, make sure other drivers can see you by turning on the hazard lights. Luggage – do not store luggage or any other goods on the roof of the motorhome. To avoid things falling down while driving, make sure everything is in its place, hitched and tied. Do not leave food or drink open outside the fridge or cupboards whilst driving. Four-way stops are commonly found at the quieter intersections – the first vehicle to arrive has priority. Drivers must carry a valid driver’s license, registration documents and insurance documents at all times while driving. An International Driver’s Permit carried in conjunction with a national driving license is recommended and must be printed or authenticated in English. Wearing seat belts when driving in a car in the region is mandatory for the driver and passengers. The use of a mobile phone while driving is prohibited, with the exception of a hands free system. There are strict drinking and driving laws – with a maximum allowance alcohol blood content of 0.05%. Translated, that means about one glass of wine for the average women and perhaps 1.5 or two for the average large man. Potholes are a major problem in most of the region and can lead to unsafe driving conditions, especially during the rainy season. Road travel at night in rural areas can be hazardous and travelers should note that abandoned vehicles, pedestrians and stray animals could present a danger. Always respect the warnings on road signs – be aware that the roads in many rural areas are not fenced, so you could find dogs, chickens, sheep and even horses or cows on the road, which makes it dangerous to drive at night. Large antelope crossing the road can also be a hazard in certain areas. Many of the national roads between the major centers are toll roads. Make sure you have a credit card or cash in the correct currency to pay. When asking for directions, self drivers may be surprised to get the response “turn left at the next robot…” – a robot is the South African tern for traffic lights. In South Africa, petrol/fuel stations are mostly open 24 hours and spread along all the routes. They are not self-help but manned by attendants who can also check oil, water and tyre pressure if required. Gratuities for this service are at your own discretion. Self-drivers should always drive with the doors locked. Do not leave anything valuable on show in the car. Try to always park in a busy, well-lit area. Do not confront aggressive drivers. If possible avoid traveling at night or in remote areas. Thieves have known to employ various methods to make a vehicle stop, enabling them to rob the occupants. Once such method is the placing of large stones in the middle of the road. In the circumstances it is prudent to carefully drive around the stones or obstacle, rather than stop the vehicle.